American School Douala - The American School of Douala, Cameroon Africa. American School Of Douala (ASD). 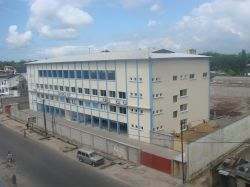 The American School of Douala was created and put in place in 1978. The American School of Douala is located in the dominantly expatriate Douala quarters of Bonapriso - a luxury residential suburb community in Douala (Prime Real Estate area), 1.3 miles from the Douala International airport (DLA). "The American School of Douala strives to develop students that will be competitive, self-confident, compassionate, and positively contribute to our global community. ASD provides a supportive, multi-cultural environment with a high-standard American curriculum encouraging students to reach their maximum potential." The concept of the school is very similar to the French Lycee Dominique Savio of Douala - without the extensive network and popularity of Dominique Savio. It seeks to provide a high-standard American style educational curriculum to its students. The schools takes care of the needs of American foreign servants in the Douala region. Key components that the school's eduction seeks to achieve are personal growth, academic excellence and global leadership skill. The school follows the United States semesters system with the first semester running from september to February and the second semester from February to June of the school year and a summer vacation from June to September. For the school annual schedule, go here. approximately 120 students make up the school from over 20 nations of the world. This is one of the best student to teacher staff ratios in the African nation of Cameroon and with great results. Government public schools generally have the worst student to teacher ratio but surprisingly produce some of the smartest kids from native Cameroonians, who go on to forge very successful careers in all fields of studies. Their education tough rough is more in touch with the real world and the realities of life. The ASD has a teaching staff of 22 from a multi-national background adding to the schools objective of providing a diverse cultural environment and understanding of global issues to its students. The schools principal language of study is english with a five (5) hours of weekly French course. ASD Staffing and governance. Get an overview of the most expensive African city, Douala Cameroon.